In regards to writing about the M-6, I'm following in the path of Mr. Church, Mr. Shrake and Mr. Dunn and their reviews, as well as many others I'm sure. If you've found this page, it's safe to assume you're somewhat familiar with the M-6 design. Since that's the case I'll make no attempt to do an in depth write up or review, but rather just a follow up. An add on of my experiences and opinions. My 2¢ on the M-6 if you will. I'm generally not one to give into peer pressure, but guns are a weakness in this area. This is one of those exceptions where I caved. I'd always been curious about the M-6 but never enough to go out and get one. It was on my "always wanted" list of guns, and that's just where I left it. Mostly because more often than not, when I have finally gotten a gun that I've "always wanted", it usually ends up a disappointment. Most would have have been better left "wanted." I was also never sure of what job or what purpose an M-6 would hold for me, but in the last few years I've fallen into the "truck gun / trunk gun" trap. Trying out different firearms to leave in my vehicle full time. My realities on it's real needs and purpose have come into focus these last few months. 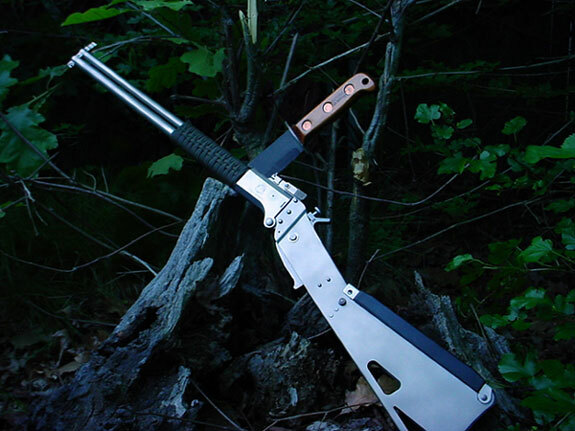 It's a pretty safe bet that I won't be stranded in the barrens, with only my "trunk gun" to feed me. Nor will I in all likelihood, need my trunk gun as a "homeland defense rifle", pressed into service fending off hoards of evil doers. Fact is, 99.9% of the time I won't need it at all. But there are the occasions where I "wish I had a gun." More accurately it's always been "I wish I had the other gun." 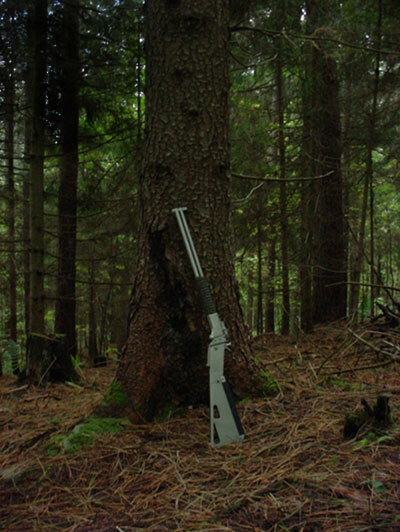 Often on hunting or camping trips I've wished I'd had a gun to take care of a certain task that popped up that I hadn't anticipated. Prepared for the fact that you generally want what you don't have... with the M-6 I have both. Hopefully the stainless gun will hold up better in my trunk, rust wise. I've yet to come up with a good way to store it though. The "M6 holster" I purchased from Springfield was way oversized for the gun. It was easily two or three times larger than it needed to be to store the M6. I sent it back and was refunded my money. Currently it resides in a rubberized "waterproof" roll top stuff sack. It works, but is less than ideal. The very FIRST thing I did to my M6 when I got it home was remove the trigger guard. I had to. I just had too a hard time getting my fingers inside of it to work the trigger. That and I felt it unecessary and unsightly. I simply spread the frame just enough and pulled it out. Then squeezed it back into shape. I then added the now common multi purpose M6 fashion statement... para cord. I used a full inner wrap, with a "gutted" para cord outside wrap, giving it a samurai sword look. 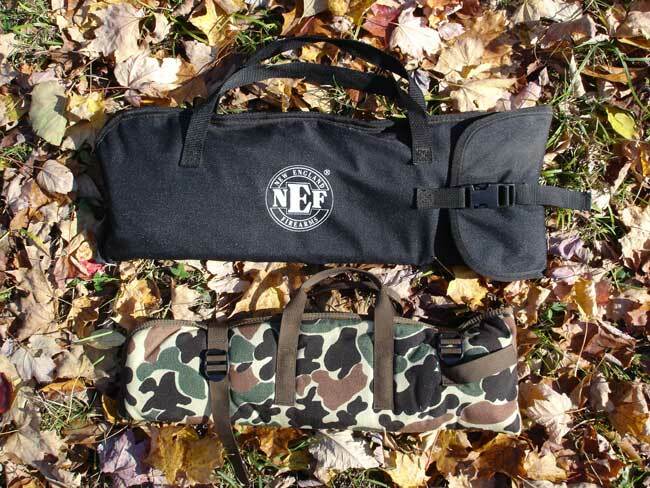 It works nice for a forend making it easier to hold and carry. I suppose it's also a good way to always have some cord on hand, but to be honest it would have to be a REAL emergency first..... it took far too long to do just to remove it without a good reason. One of these days I'll make up a sling for it. The only thing that's held me up thus far is that I'm holding out for stainless sling swivels. I can't find them local, and I've been having a hard time justifying a special order for something I really don't need. So for now it's sling-less. 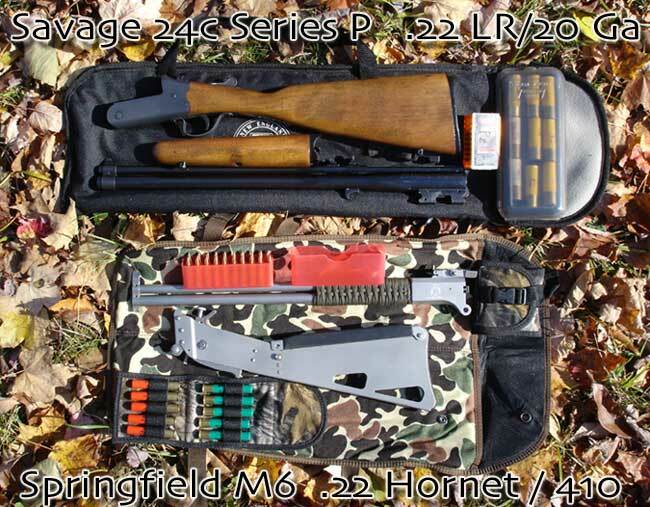 The Springfield M-6 I chose is a Czech made gun in .22 Hornet over 410. With this combo I felt I'd have most of the bases covered. Capable of taking small game, but with with enough power for large game in a pinch. After playing with the M-6 a while, I also feel comfortable that a 22 Hornet over a 410 slug would fill in nicely in a personal defense roll in a bad situation. Again, not a first choice, far from it. But should push come to shove it's a powerful little tool, and an option that's always there. The cute little folding gun is also more likely to be seen in a better light by law enforcement than a full blown rifle or shotgun would in my car. I'm not out "looking for trouble" riding around with this silly little gun. No being mistaken for a gang banger with this one. My goal in loading for the 22 Hornet M-6 was to find and accurate load, no matter what it might be. My hope was for either a an accurate fast (for the Hornet) heavy bullet load, or mid velocity load with lighter bullets, to limit damage on small game. While the heavier 50 & 55 grain loads looked promising at first, in the end the best shooting load turned out to be a Hornady 45 grain bullet with a charge of 10.3 grains of IMR4227. This load gave me 50 yard groups in the 5/8th of an inch range. It doesn't sound like much, and would be disappointing in a bolt action rifle. But when you factor in the crude trigger mechanism and sight system on the M-6, it's pretty impressive. 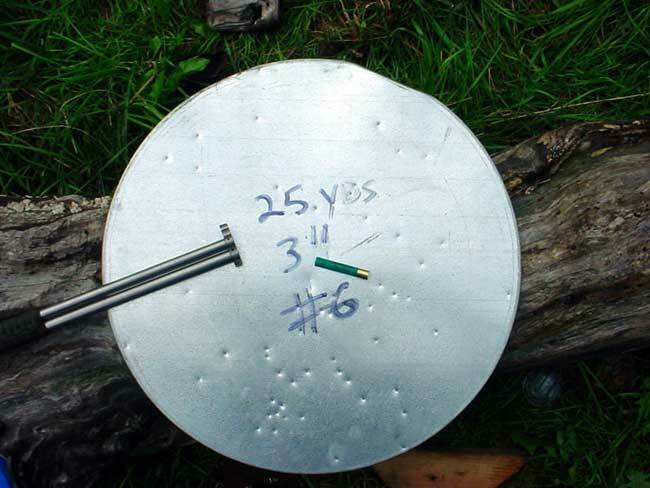 Chronographing the load showed a velocity of 2200 fps from the 18 inch barrel. Again, in most 22 Hornet rifles, this is low to mid range velocities for this weight bullet, but my goal wasn't for warp speed. I was aiming more for of a reloadable .22 Magnum. That's about what I have in that load, so I'm happy with it. 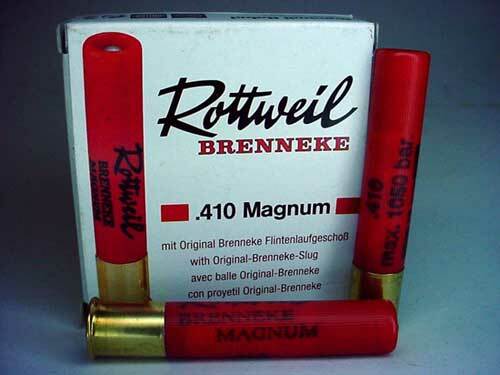 The 410 barrel. I have a nice little Italian single in 410, and to be honest it's never gotten much use. I've shot some hand thrown trap with it, and hunted with once in 25 plus years. Going in I knew not to expect much, but my results weren't so bad. Before I go any farther, I need to mention the M6's flip up "shotgun sight". On my particular gun, this sight is all but worthless. It's far too low for the shotgun barrel and using it makes the shotgun barrel print far too low. I have to wonder who's idea it was to make the shotgun sight shorter than the rifle sight, seeing as how the shotgun barrel is below the rifle barrel. Oh well. I've filed my shotgun sight to match the rifle sight, turning the "v" express sight into a standard rear. While it's really too close to the eye for a non-peep rear sight, I find it somewhat useful in low light situations where the stock rifle peep sight doesn't work. So I have two rifle sights and no shotgun sight. 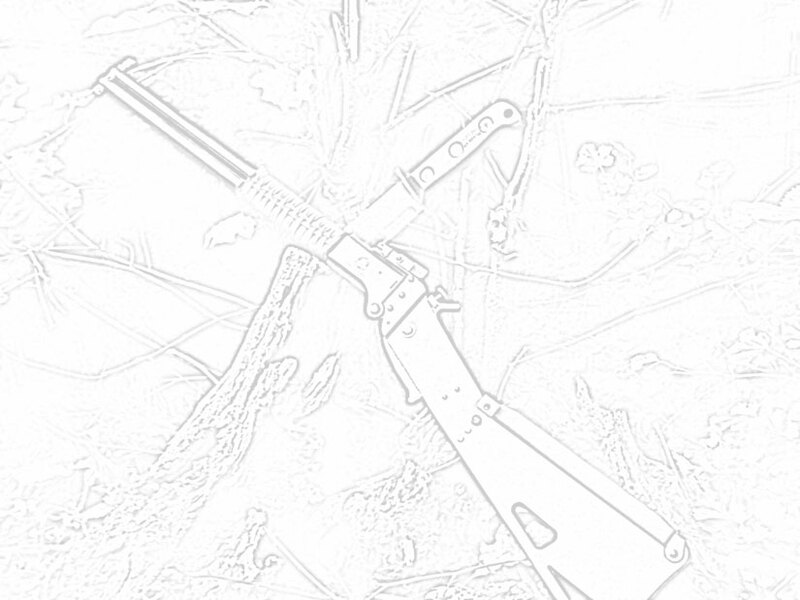 I don't find this to be a problem for shot shells as the front blade works fine by itself for arial targets and for stationary aimed fire, the peep sight can be used as you'll see below. As far as shot shells go, I've only played with two 410 shot loadings in the M6 (not counting a few left over odds and ends). They are the Winchester 2 1/2 inch #8 load and Remington 3 inch #6 load. Patterning these two loads for the attached photos was done on 24" metal disks. The distance was 25 yards. These two photos are representative of multiple rounds fired. The 2 1/2" #8 load proved a bit disappointing with large gaps in the pattern. A wide spread with room enough for small game to escape free of harm. The 3" #6 load did rather nicely with a tightly grouped center, with only a slight vertical spread. The pattern in this photo is a bit low due to shooter error. I'm more than happy with this loads performance and will be the one I keep on hand from now on. Click to enlarge. I'd played with 410 slugs in the past, and was not overly impressed. They were mostly Winchester brand slugs. When I bought my M6 I purchased some RWS slugs to try in it. My first attempts at actually hitting anything with the slugs was a bit of a joke. I fired 5 rounds on the 50 yard rifle range. Not only could I not hit the target, but couldn't hit the 2 1/2 x 3 foot backer board. I was let down to say the least, but I later learned the problem wasn't with the slugs or with the barrel itself. The problem again was the far too low shotgun "V" sight. When I got the chance to experiment with the M6 in a less restrictive range setup, I was able to find out where the slugs were going. With some trial and error I came up with the improvised sight hold show below. With this sight hold I was able to center hit a soda can at 25 yards every time. Now I was impressed! This little sucker shoots. This single round was fired at 40 +/- yards. A bit high... my fault. I WILL be ordering more of these RWS slugs. It shoots them so well it makes me wish there were a few more 410 holes in the stock storage. To date I've got very litlle "in woods" time with the M6. I hope to change all this as summer turns into fall and my opportunities increase. I also hope to add any new useful information as it comes about. To wrap it up for now... In simple terms, so far so good. Right now I'm pretty happy with my M6, and if it stays that way, it'll change from and "always wanted" gun, to a "why'd I wait so long" gun. That would be nice for a change. I spent the last three days bum'n around the woods with my M6, pretending to squirrel hunting. Not being a fan of eating shot, I generally don't shoot small game with a shotgun. All hunting was done with the 22 barrel. When I first read some of the other M6 reports, I was surprised that some felt the need to open up the rear peep sight. 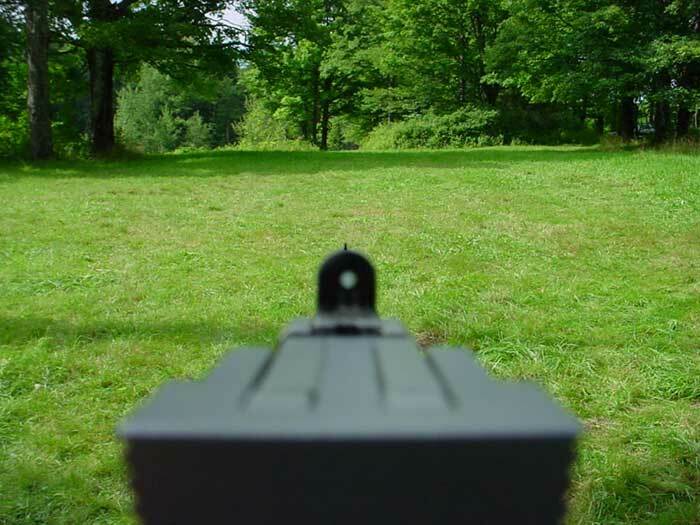 Up till now, all my shooting had been at the range or on open green fields. This weekend I found that the stock peep sight is just about useless in the heavy wooded areas where I hunt. A good portion of the time I was unable to see anything through the peep, often including the front sight. I missed four squirrels because of this. One I fired and missed, but with a poor sight picture. The other three times I missed the opportunity all together, not able to pick up the target fast enough. I took the tip from Mr. Shrake and opend the rear some. That helped some, but not enough. Over the next few hours of playing and trying, I opened the rear peep up several times. 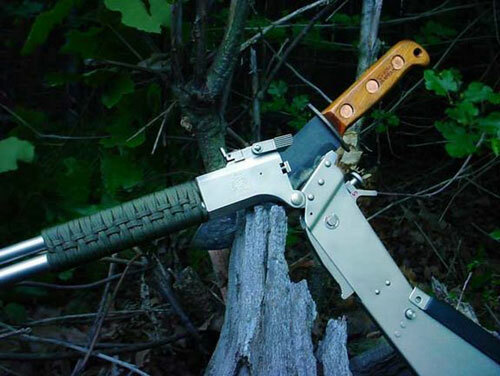 The finished product now looks more like the rear peep on an M1 carbine, than a factory M6. I'm sure it's a whole lot less accurate now, but it was meaningless accuracy if I couldn't apply it in the woods where it counts. It's not much of an upate, other than realizing that I've had a case for my M6 about two years now, but never added the photos. 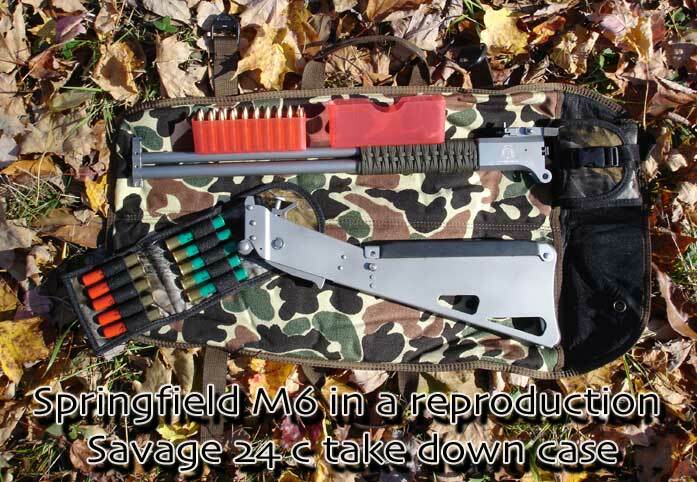 I eventually found a reproduction Savage 24c take down case and keep my M6 and ammo in it. Oddly enough, since I wrote the original text I've purchased another Savage 24, this time a model C. yet I don't keep it in the 24c case, but rather one sold by new England Firearms. 45 Colt throats for Pete's sake.